Online learning has been on the rise in recent years, and it’s really not hard to see why. On the one hand, eLearning courses have become hugely popular by the simple virtue of being so much more convenient than traditional face to face courses. Students can fit them around their existing responsibilities and commitments, and can engage with multimedia content and learning materials at whatever time is most convenient to them. Even better: they don’t have to travel anywhere to study, they can simply log in to the virtual campus from the comfort of their own home or office. There’s a second reason why online learning has become so popular: it’s cheaper. Cost can often be a prohibitive factor in why individual students don’t enrol in courses they’re interested in. This is also an issue for corporations who wish to encourage their employees to undergo further training but don’t have much of a budget for conferences and training courses. Online courses are easily accessible on much smaller budgets. In addition to the convenience and the cost, a large number of students are turning to online learning courses because they have become a better way to learn. Those students who are serious about improving their understanding, learning new skills and gaining valuable qualifications are keen to enrol in the type of course that will be the most effective. Here are five reasons why online learning can be more effective than enrolling in a face to face training course. IBM have found that participants learn five times more material in online learning courses using multimedia content than in traditional face to face courses. Because online courses give students full control over their own learning, students are able to work at their own speed. Generally students work faster than they would do otherwise and take in more information. They are able to move faster through areas of the course they feel comfortable with, but slower through those that they need a little more time on. Many offline courses struggle to retain students throughout the length of the course. The Research Institute of America have found that this is not the case with eLearning. Rather, online courses have increased student retention rates from anything from 25% to 60%. It’s been suggested that more engaging multimedia content, more control over how they take in the material and less likelihood of classes clashing with other commitments all contribute to this rise. Many students are put off enrolling in a face to face course due to the time investment it will require. This generally involves the time to get back and forth to classes, plus the time spent waiting for tutors and other students. 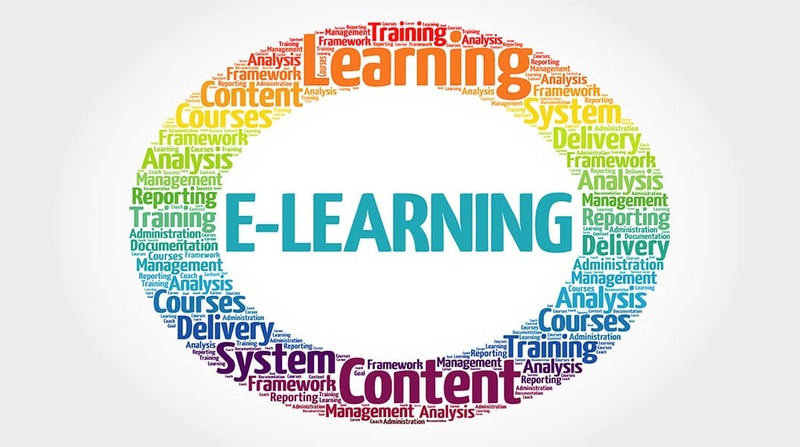 A Brandon Hall report on eLearning within corporations found that this style of learning typically requires 40-60% less employee time than learning in a traditional classroom setting. It’s also key to note that eLearning options generally allow students to split the time they are investing in the course in whichever way works for them. They don’t need to be able to dedicate large chunks of time to the course: it’ll work just as well if they can set aside half an hour from their lunch break each day. One of the great things about online courses is that assessment can become more of an ongoing process. This is good news for students as interspersing multimedia content and learning materials with regular short tests can improve student engagement. In fact, research from Harvard showed that using these short, regular tests halved student distraction, tripled note-taking and students’ overall retention of the content improved. It’s also worth noting that the mort often students are assessed, the better their tutors are able to keep track of their progress. Increased student tracking means that tutors are able to step in earlier when assistance is needed. Online learning is certainly the more effective option for students, but it’s also better for the environment.The Open University in Britain have found that online courses equate to an average of 90% less energy and 85% fewer CO2 emissions per student than traditional in person courses. This certainly makes online learning and multimedia content a more effective method of education overall. Promoting and engaging in this kind of learning can help both individuals and corporations to do their bit for the environment and stick to their own personal environmental goals. Interested in finding out more about the most effective way to learn languages? eLearning courses utilise high quality multimedia content to increase student understanding and provide an impressive virtually immersive experience. Why is SCORM Important When Learning a Language Online? Is Flipped Classroom the Most Effective Method for Learning Languages?